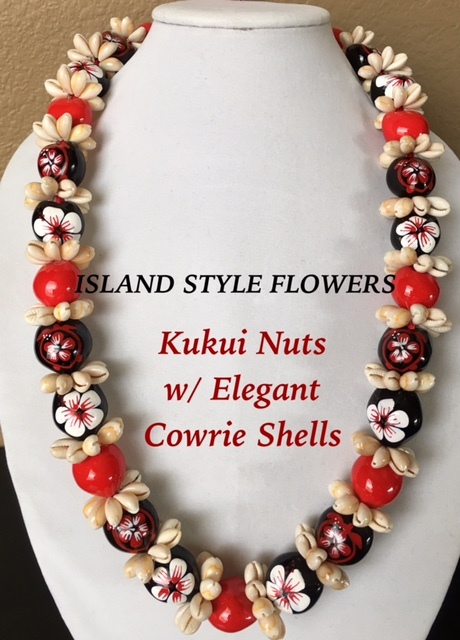 This specialty lei is adorned with Solid Color Nuts, Hibiscus flowers nuts, & Honu Turtle with Hibiscus flower Kukui Nuts, and accented with Cowrie Shell Rings. Making this a beautiful and elegant lei perfect for Graduations, Weddings, and any special occasion. *** NOTE: This is a SPECIAL ORDER -style lei. Please contact us at 702-778-6337 for availability and to place orders of 10 or more leis.